The introductory materials for the Journey Bible are generally very good. Beginning the with some remarks on exploring the spiritual, the best part of this material is the “How to Seek God” section, which offers some great reflection questions for Christians as well as those seeking God. There is also a fabulous four page summary of the Bible in its own words, which although neglecting the early Church (and thus most of the New Testament) nevertheless is a great idea and introduction to the Biblical metanarrative. There are then several sections about understanding, learning about, and following Jesus which are very solid. Concluding the introductory materials is an easy to reference list of important Old and New Testament events. The end matter of the Journey Bible consists of some information about the NIV, several pages of topical indices, outlines for a two week seeker Bible study, and a short dictionary combined with concordance. Overall, the introductory and reference materials in the Journey Bible are useful, easy to navigate, and should serve quite well those engaging the Bible for the first time. The text of this Bible is your typical New International Version (2011) with standard footnotes. Scattered throughout the text are seven “explorer” themed commentaries: Discovering God, Knowing Yourself, Answering Questions, Strengthening Relationships, Reasons to Believe, Why Jesus?, and Managing Resources. The contents of these commentaries are generally theologically sound and do a good job of addressing questions which might naturally arise from reading the Biblical text. Historically minded seekers might have been aided by a context or history theme, but the message of these features are well worth the read. Additionally, there are several “Explorer Stories” scattered throughout the Journey Bible, recounting personal tales about the road to finding God. These were generally good, if a bit devotional at times. Another unique aspect of the Journey Bible is the “Five Alive” program, where readings from Genesis, Deuteronomy, John, Acts, and Romans are encouraged, both with a reading program and through shaded “tabs” on the pages of this Bible. All these features do an admirable job making this Bible accessible for those seeking to understand God through His Words. Despite all the great features of the Journey Bible, it is not without some peculiarities. The introductions to the Biblical books are typically too short to adequately contextualize those unfamiliar with the Bible to their contents. Exasperating this problem are the grouped introductions; for example, 1 Timothy, 2 Timothy, Titus, and Philemon all share one introduction section. While it is important to read the Bible on its own terms, understanding where a book came from and who it was addressed to, as well as its basic purpose and message remain vital components for a sound and formative reading of the Bible. The one redeeming feature of the introductions was the inclusion of timelines noting important historical events surrounding the book being introduced. However, the introductions were the most disappointing feature of the Journey Bible, especially given its intended audience. Furthermore, certain portions of this Bible appear to assume to much on the part of its reader. While the non-Biblical material as a whole should serve as a well-rounded introduction to the Bible, there are sections of this Bible which feel more geared towards those who are already Christians than those who are using this Bible as a tool in their quest for God and truth. Obviously these portions are of great benefit for those who are already Christians, but their inclusion in this particular Bible is somewhat vexing. 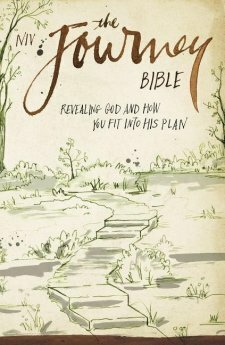 Overall, the Journey Bible makes a great Bible and resource for those investigating what Christianity is all about, although it would seem best suited for those already somewhat familiar with Christianity. The tools included in this Bible, especially its suggested reading plans and resources for learning the broad story of the Bible relatively quickly, make it useful not only for those seeking God, but also those who have already found Him and are looking to grow in their faith. In conclusion, the NIV Journey Bible is highly readable and useful Bible—engage this book and apply it to your life. The reviewer is well aware of the problems with the New International Version in general. The point of this review is not to reiterate those concerns, but rather to comment on the presentation of this specific Bible. It is worth noting that all translations are imperfect interpretations. An introduction like this one would be a welcome addition to many other versions of the Bible.